Aajkaal is a Bengali daily started in 1981 and owned by Aajkaal Publications Pvt. Ltd. 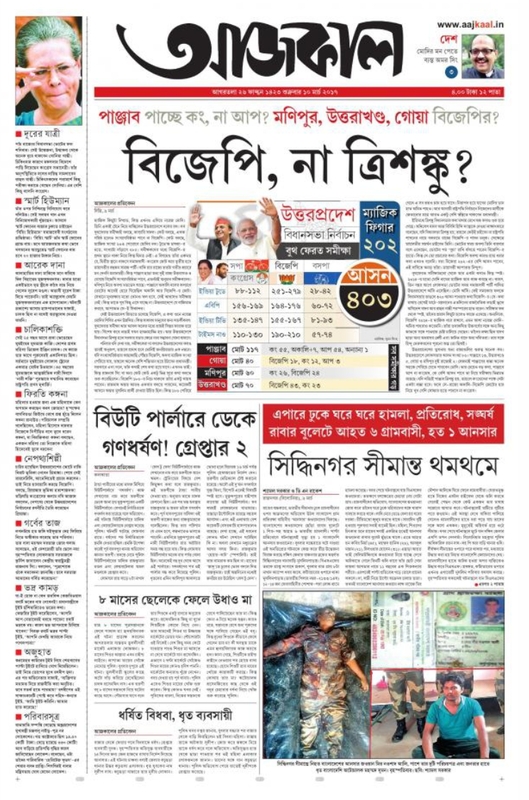 The Bengali newspaper is published in Kolkata, Siliguri, and Agartala and brings the up-to-the-minute news on current affairs in India and all over the globe, business, sports, entertainment, science, and health along with loads of local news for the Bengali readers over there. It is an outstanding way of getting utmost returns on the investments done on advertising. Here is why you should consider advertising in the Ajkaal. You can easily book your Business Ads, Matrimonial Ads, Property Ads, Recruitment Ads, Tender Ads, and Announcements at discounted rates in the Ajkaal via Buymediaspace. Buymediaspace can make Ad booking easy in the Ajkaal across major cities like Kolkata, Siliguri, and Agartala. Aajkaal is a credible Bengali daily and enjoys an extensive reach. The readers get influenced by the ads seeing as it is in the classifieds of a well-regarded publication house. Aajkaal is read far and wide and is well-liked in cities like Kolkata, Siliguri and Agartala. The readership of Aajkaal is spread amongst in cities like Kolkata, Siliguri, and Agartala. Hence, the advertisers booking an ad in Aajkaal Classifieds page will certainly get a great ROI due to its huge reach. Aajkaal is catering to a large audience every day as it has readers across all ages. Readers of all age groups prefer the daily and it can be seen in hands of almost everyone who loves to read. Buymediaspace offers you a platform to check ad rates, circulation details, and combo packages and allows you to book ads online for Ajkaal without any troubles or complications! We are India’s leading online ad booking service provider! With Buymediaspace, you can book a variety of ads such as Ajkaal Classified Display and Text Classified at no extra cost!! On successful payment, you will receive an invoice on your registered email id with your ad booking and payment details. Your ad is ready to be published on the specified date(s) once it passes through the editorial approval policies of Ajkaal newspaper.